Lately, my daughter has a learned that the 12th Imam (AS) is still alive and that he is in hiding. She understands that when he comes out of hiding, we will be able to see him and that we want to try to be friends with him. I want to develop that understanding further, to elaborate on what it would mean to be friends with him. What should we be doing in our lives so that we are ready to be friends with the Imam (AS) when he returns? For this, I created a tiny booklet to spark our conversation. On the first page, I wanted my daughter to think about something that she is doing that she thinks would make the Imam (AS) very happy. Some examples that you can discuss if your kid is confused and stuck is that your kid might be kind and respectful, or generous. He might be grateful for all his blessings. She might pray regularly or recite the Quran. He might be planning to fast in Ramadhan, or she might be wearing the Hijab. 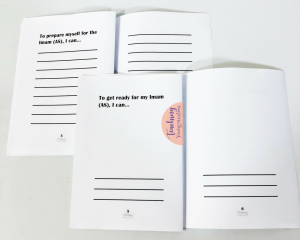 For younger kids, the booklet has an empty space so that they can draw a picture and/or write a sentence, and for older kids, the booklet has a lined space to write and reflect. On the second page, I wanted to examine the opposite. Is there something we are doing that would make the Imam (AS) unhappy? Are we being disrespectful? Are we ignoring our Wajibaat, our obligations? Are we forgetting to say Bismillah? Are we selfish, or ungrateful? Again, for younger kids, there is a space to draw a picture and write a little bit, and for older kids, there is more space to write. The next page asks the kids to reflect on what they can change, what they might do differently, to prepare themselves. 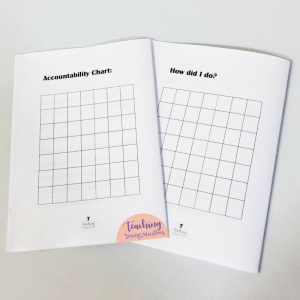 After they record their thoughts, in pictures or in words, they can then prepare the accountability chart for themselves or with adult help to implement that change. Whatever action they decide to change for themselves, they can use the given accountability chart to track how they do. The accountability chart is blank so that you have the option to use it for 7 different actions over the period of a week, or one action over 7 weeks. Though this book is aimed at kids, it is a good reflection tool for adults as well – are WE preparing ourselves for the reappearance of the Imam (AS)?! I pray you all find this booklet to be beneficial. This mini-book is available as a FREE download in the Resource Library. Sign up here to receive the password to access it. If you already have the password, click here to enter the library. 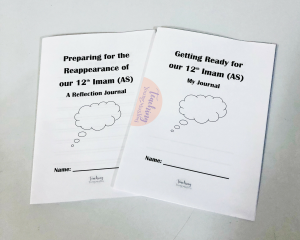 Click on “Sha’baan,” then scroll down to “Preparing for the Reappearance of the Imam (AS) Booklet” under “15th Sha’baan.” You can choose whether to download the one for older kids or younger kids, and you can also choose which size paper you need.